For me, a big part of the pleasure of giving a loved one a gift is in the wrapping. I'm not planning to give or receive many gifts this year — I have enough stuff, for real — but I get such a kick out of wrapping presents that the rest of my family tends to delegate all their gift-wrapping to me. With a few mugs of mulled wine and a podcast or two on the stereo, it's fun and an easy way to be creative on a small scale. And you don't have to spend a bunch of money on paper and ribbons, either. You can wrap great-looking presents with stuff you probably already have on hand. Click any image to enlarge. What you'll need: 1) Presents to wrap (duhhhhh). 2) Wrapping paper. I like rolls of matt brown mailing paper, such as that made by Scotch, because they're cheap and easy to DIY with paint, markers, or anything else you have a mind to use. (You can also turn brown paper shopping bags inside-out.) Dodai put me on to using Metropolitan Transit Authority New York City subway maps, because they're handsome, they are quite huge unfolded, and you can get them free at any subway station. Maps make great wrapping paper — see if your local transit authority has decent ones, or check out a tourist information center in your town. Old fashion magazines also make great wrapping paper, like this issue of 10 that's been kicking around my place since like 2008 (they're reference materials. My old magazines are reference materials). 3) Glue. 4) Tape. 5) Scissors. First, I'll show you how to make a simple box out of a fashion magazine cover, suitable for giving anything small-ish — jewelry, a few pieces of fudge, whatever you've got. There are many kinds of boxes you can make easily at home, either using origami techniques or with scissors and glue, but I like these squashed-ellipse boxes because they're easy, quick, and an interesting shape. Choose a magazine that has a nice, reasonably thick cover. You don't want any flimsy ladymag stock here. First, carefully cut the cover off the binding. Trim the rough edge straight. Lay out whatever you're giving — in my case, an old Dieter Rams lighter I picked up on eBay for a design writer friend who loves Rams' work — and make some quick measurements. I figured based on the size of the lighter I was going to need to make a box that was at least 4 inches long and 3 inches wide. Allowing room for a tab for glue and the closure tabs on the top and bottom, that meant finding room for a 8.75 inch by 5" rectangle within the magazine cover. On the right side of the cover, use a letter opener or a dried-out pen to score the two edges of the box, and carefully cut along the top edge. Fold the box along the scored edges, and tuck in that tab. See how it's coming together? On the wrong side, mark where the scored edges lie in pen, and then use a straight edge to find a 90-degree angle. Mark where that 90-degree line intersects with the scored edges. Use a large, round object — significantly wider in diameter than your planned box — like a bowl or a plate to draw even curves between your marks. Press hard with the pen to score, because you're going to be folding along these lines. Using the same object, draw a set of outer curves, also between those same marks. You don't have to press as hard on these. Cut carefully along the outer curves. Spread glue evenly and quickly along the full width of the glue tab. Stick the tab to the other edge of the box. Press the box flat under some books until it dries. Take out the box and cut two little half-moons out of the top and bottom tabs, as shown. Put in your gift, tuck in the top and bottom tabs, and ta-da. Make a label out of the left over part of the cover. One reason I love giving people things in boxes is because then, the box becomes part of the present — something durable, useful, and handsome. For this reason, rather than just paper-wrapping the shoebox I'm using to hold another of my gifts, I'm going to actually re-cover it with brown paper and a subway map. To do this, first measure a length of paper big enough to fully cover the bottom and sides of the bottom part of your box. Rolling the paper backwards onto the roll from whence it came a few times helps reduce that annoying curly-wrapping-paper issue. Measure so that the paper will be deep enough to cover the sides of the box and about 1 inch more. Draw around the bottom of the box in pen. Cut out the brown paper as shown. Leave tabs on four of the eight sides. Cover your work space with newspaper or scrap paper, and spread the glue quickly over the paper that's going to cover the bottom of the box. Matching the edges of the box with the lines you traced before, place it on the glue. Quickly turn it over so you can smooth out those air bubbles. Use your fingers or a piece of cardboard. Spread the glue in the same fashion over the two sides, the ones that you left tabs on. Smooth the paper over the lip of the box. Press out any air bubbles. Then glue on the last remaining sides. Let it dry. ...because this gift happens to be everything it takes to make a Manhattan: my new favorite rye, Carpano Antica vermouth, maraschino cherries some guy at the store told me were really good, and Angostura bitters. Now this gift is done. Another fun way to dress up plain brown paper, besides potato-stamping it, drawing on it, or painting it, is sewing it. Just set your machine to its longest stitch length, pick pretty thread colors, and go to town on a pre-measured length of wrapping paper. I followed a pattern I call "invented topographical pastel." These are the results, on a book I wrapped for my mum. It looks a bit too subtle in the photo, but in real life it's quite pretty. And of course, there's always the traditional "turn fashion magazine pages into wrapping paper" approach. Like using maps for wrapping paper, it's essentially free. I cannibalized these pages from the same old issue of 10 whose cover I used for that box. 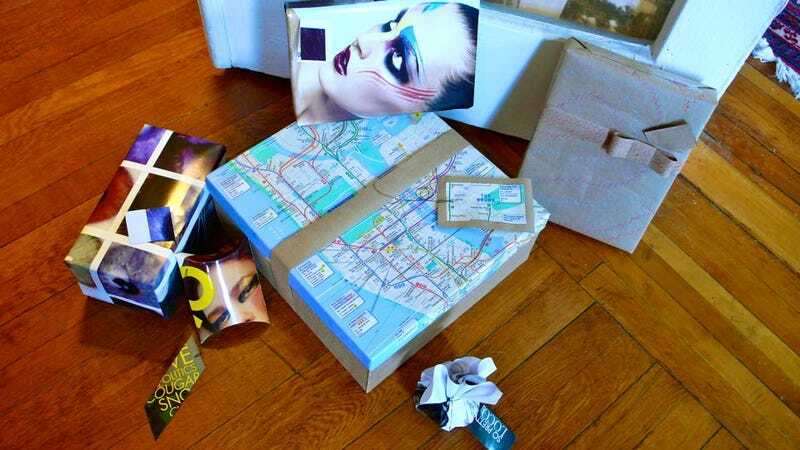 Magazine wrapping paper is best for small gifts, but what the pages lack in area they more than make up for in their ability to hold a crisp crease, rich printing, and distinctive imagery. If you need a few package-wrapping pro-tips, my colleague Brian Moylan (who used to be a professional gift wrapper) has you covered.